Recently, I got to catch up with two separate groups of former co-workers at Momofuku Nishi and Blue Ribbon Federal Grill. While the types of cuisine and locations were very different, both places provided a really fun and casual place to reconnect with friends and tuck into some good drinks and food. At Momofuku Nishi, we ordered a couple of small plates to start but the main event was the Pok Pok and Nishi fried chicken offering, while at Blue Ribbon Federal Grill, which had only just recently opened in the Financial District, we ordered as much food as three girls could stuff down our gullets. Jajangmyeon with pork sausage; chili pan mee and fried egg. 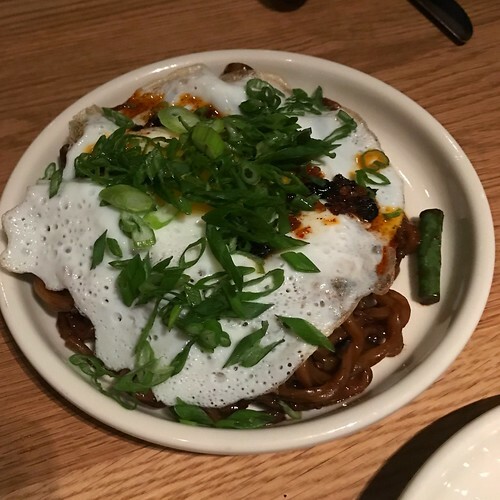 A riff on a traditional Korean/Chinese noodle dish made of fermented black bean paste and usually pork but here, dressed up with some spice and a runny egg. Typically, the noodles are served with julienned or grated cucumber and/or carrot to add some freshness and crunch and I think that element was unfortunately missing here. Bone marrow with XO sauce, milk bread and herbs. 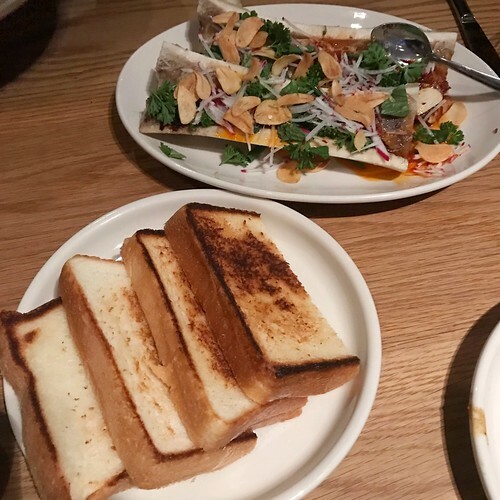 An interesting and slightly funky take on the typical fatty bone marrow and toast combo, which had a nice balance between the sweet and slightly squishy bread and the pungent flavors of the marrow. And finally, two fried chickens – one midnight fried chicken from Pok Pok served with chili garlic sauce and tamarind sauce and then the Szechuan style fried chicken from Nishi with hot sauce and honey butter. Side dishes included an absolutely monstrous plate of super dense and buttery green onion biscuits, a papaya salad with miso (because you know…plants) and toasted rice. 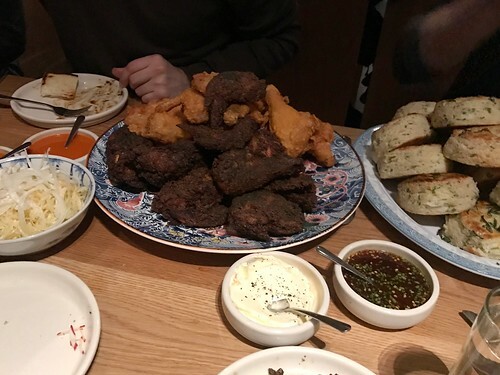 We dug into this hard and actually managed to finish it all, which we’ve found is surprisingly hard to do on most large format Momofuku dinners. My favorite of the two chicken styles was the spicier and tangier Szechuan and even though it was absolutely freezing outside, my post-dinner flush kept me warm enough to walk all the way home from Chelsea back to Soho. When Blue Ribbon Bakery Kitchen in my neighborhood closed this past winter after years of serving American comfort food, it definitely felt like there was a sudden dining hole in the neighborhood. Luckily though, the Blue Ribbon family was able to move all of the staff down to the new restaurant Federal Grill in the Financial District at the AKA Hotel, where they’re now offering slightly fancier fare in a posh setting. Alice, Vanessa and I got to try it for the first time right around when it opened to the public and it was so wonderful to see so many familiar faces and treat ourselves to a really standout dinner where the service was incredibly warm and gracious. 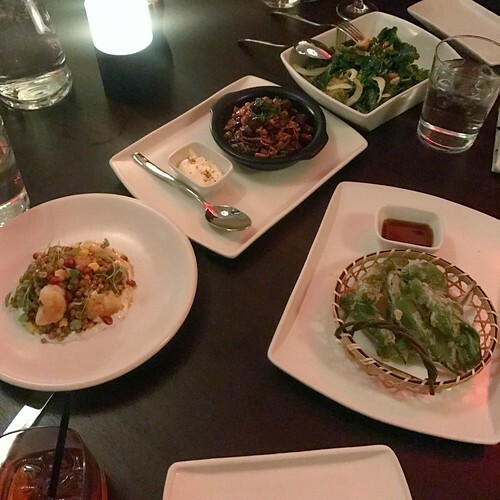 Below – beef shin with spatzle, cornichons, beets and caraway cream; shishito tempura with malt ponzu; baby kale caesar salad and farro and shrimp with poblano peppers, grilled corn, pomegranate and mint labneh. Of these, my favorites were the beef shin, which was perfectly tender and full of earthy flavors, and the farro and shrimp, simply because it was a really well executed dish and something completely new to me, bringing together flavors I never would’ve thought would complement each other. 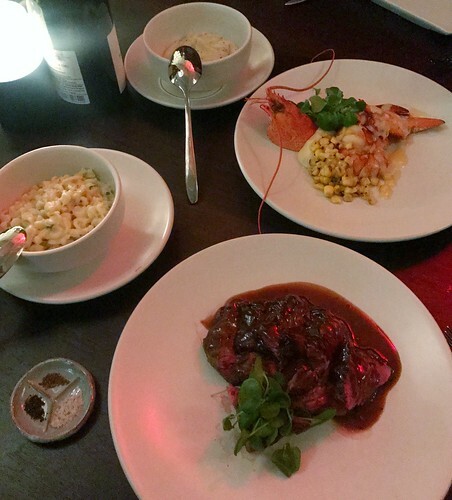 For our mains, we split the bavette steak with bourbon and black pepper sauce; the insanely good, perfectly cooked Maine lobster with potato, corn and miso butter (highly addictive) and then the truffled potatoes and cheesy spatzle (think macaroni and cheese on crack). So much food but we had no problem eating it all. Luckily we were seated in one of the larger banquettes, where if we really needed to, we probably all could’ve lay down for a quick nap in between courses. 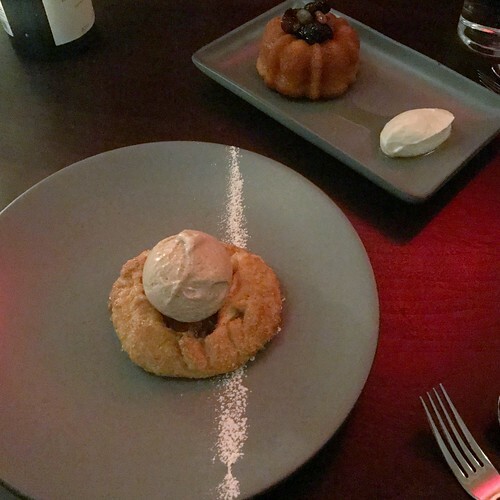 Alice and Vanessa insisted on also getting dessert even though we were absolutely stuffed so we went with the apple pie with cinnamon ice cream, which I actually ended up being crazy about, and the incredibly alcoholic baba au rhum with creme fraiche. I took a couple of bites of each and finally gave up. I’m definitely biased when it comes to Blue Ribbon but have to say that they’re doing a really nice job at the new location, which is completely different from what Bakery Kitchen ever was. The food walks a nice balance between the familiar and domestic vs. unique and worldly, the service is as awesome as ever and I’m sure they’ll have no problem filling their seats with new regulars downtown. Especially want to thank Roghan, Laraugh, Bessie, David and Sam for their wonderful hospitality and can’t wait to go back soon. You are currently reading Momofuku Nishi and Blue Ribbon Federal Grill at Notes on Food.